Getting your cat more active can be tricky, especially now that many have realized that letting your cat outdoors is not the best option. It’s an unfortunate fact that the trope of the fat cat has made feline obesity seem normal. While cats require a much higher rate of beauty rest than us mere humans, they do need their fair share of exercise. Getting your cat more active can be tricky, especially now that many have realized that letting your cat outdoors is not the best option (dangerous for them and the environment). Fortunately, there are more than a few ways to keep your cat active and at a healthy weight. Consider how wild cats may eat – often its smaller meals throughout the day with a hunt involved. Rather than leaving all of the food out at once try hiding multiple smaller bowls throughout your home in different places. Not only does this help keep your cat active, but it simulates their natural habits. You can also try puzzle feeders if food needs to stay in one place. Cats love a good game of hide and seek! To play with your cat start by placing a toy in a visible location – when they retrieve it, they get a treat. After going through this game several times, they’ll quickly learn the rules, and the hiding places can become more inventive. 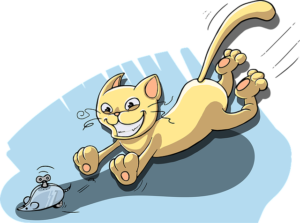 Most cats have at least one toy that gets them hopping to and fro – whether its a ball, string, catnip toy, or a feather. Once you’ve found a toy that your cat enjoys make sure to set time aside every day for playtime. You can also try making toys to see what will get your pet going. Simple things like balled up paper, sections of paper towel roll, and plastic bottle caps are often just as appealing to cats as more expensive playthings. Just be sure that whatever you use is large enough and of a material that it cannot be ingested. Cat trees are a great way to increase activity and give your furry pal a place to rest. Often, these will include scratching posts that help keep claws away from furniture. When on a budget, a cat tree can be simulated with some simple handiwork! Last but not least, keep an eye out for fluctuations in weight. For cats and other small animals, even minor weight changes can be signs of significant problems. You might not worry if you lost a single pound, but when you weigh less than 10 lbs, overall one is 10% of your body. Likewise, if you notice your pet gains significant weight that can be an issue as well. In the event of weight, changes make sure to consult with your vet! This entry was posted on Friday, March 29th, 2019 at 5:04 pm. Both comments and pings are currently closed.